For a fit that flatters – use the Shape-A-Dart on commercial patterns to adjust the cup size to YOUR cup size. Why use the Shape-A-Dart tool? Misses size patterns are made with a standard “B” cup and half sizes are made with a standard “C” cup. If you wear a Misses size pattern and wear an “A”, “C” or “D” cup bra, your bodice will be baggy (A cup) or tight with wrinkles (C or D cup). The same thing applies to half sizes that wear an “A”, “B” or “D” cup bra. The Shape-A-Dart tool has PRE-MEASURED dart widths to correct darts on all commercial patterns, beginning with size 6 and going through 24 1/2, and includes sizes 38 to 46. Simply find your pattern size and PERSONAL bra cup size on the Shape-A-Dart and make the correction. Every pattern will give you “a fit that flatters”! Do your blouses, dresses and jackets look like the “before” pictures? 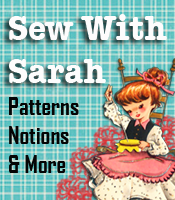 Simply adjust the dart on the pattern with Shape-A-Dart, following the easy instructions that are included, and you will have a perfect fitting garment and a “fit that flatters”! Do your customers a favor and have one of these handy tools available in order to be able to adjust the cup size on the garments you’re sewing for them. The SimFlex Expanding Sewing Gauge gives you fast and accurate measuring. It is quick and easy to use. At first glance, you’d think it might only be for measuring button/button hole spacing. While it is PERFECT for measuring accurace spaces for buttons and buttonholes, it has many other uses. The SimFlex Expanding Sewing Gauge is great for use in shirring and smocking. 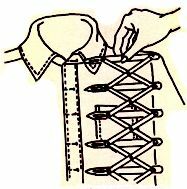 Simply flex the gauge to the distance desired between the gathers when shirring or smocking, mark the sewing lines with chalk or washable marker. This sewing gauge can also be used for measuring pleats, tucks and gathers in draperies and skirt and dress pleats. For the quilters, this gauge can be used to mark several bias or straight strips at a time. This sewing tool costs $15.95 and is available from SewWithSarah.com. 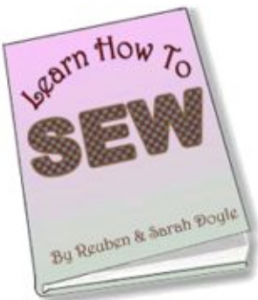 The sewing tool comes with complete instructions for the various uses of the product. I would highly recommend this tool. The time saved by getting instant and accurate measuring distances for such a variety of applications makes it well worth the money spent on it.